Coat of Arms: The Queensland coat of arms was granted by Queen Victoria in 1893, and is the oldest in Australia. 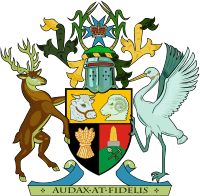 The coat of arms is composed of a Red Deer and Brolga supporting a shield divided into three sections. The top section of the shield displays the heads of a bull and ram, the left corner contains a sheaf of wheat, and the right corner features gold rising from a pile of quartz. Two stalks of sugarcane support the state badge, and the Crown of St. Edward rests above the shield.